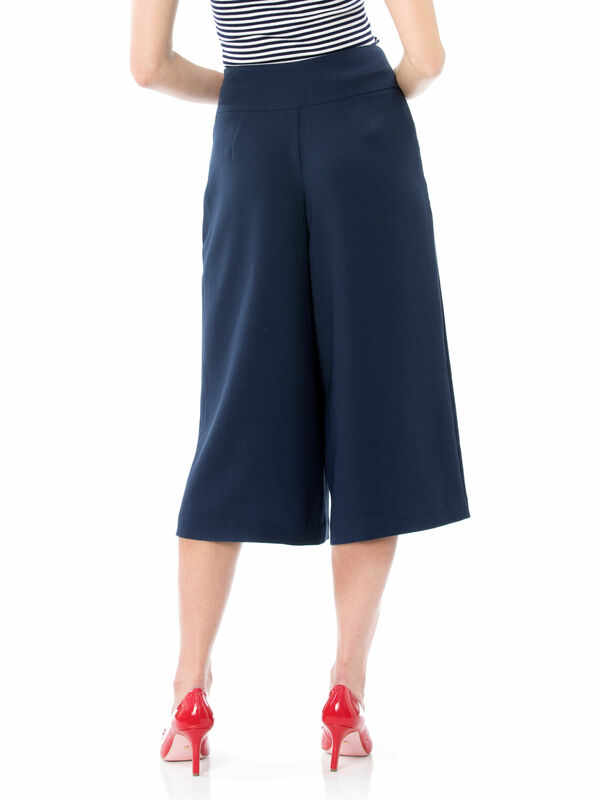 Cece Culottes https://www.review-australia.com/au/cece-culottes-navy/RE19PA026.RENVY009.html A new classic, the Cece Culottes are as chic as they are unique. The wide leg cropped culotte style makes a fabulous alternative to capri pants and skirts throughout the seasons. In a nautical navy with white trim, they'll go with all your bright or neutral essentials. Pair with a heel for extra flair. Worn with Cherry Baby Knit Top, Minnie Heels and Cherry Be Mine Bag. A new classic, the Cece Culottes are as chic as they are unique. The wide leg cropped culotte style makes a fabulous alternative to capri pants and skirts throughout the seasons. In a nautical navy with white trim, they'll go with all your bright or neutral essentials. Pair with a heel for extra flair. Cece Culottes is rated 4.9 out of 5 by 32. Rated 5 out of 5 by Shellotty from So comfy yet classy Was plesantly surprised how comfortable these pants are. There is a little bit of give in the fabric. The style is such you can dress casual, or dress them up. Rated 5 out of 5 by Mimi33 from Stand out features Bought this at review myer Indooroopilly and i am so in love with them. I had tried them on a few times before and kept thinking i looked bad and big. I wasn't sure how to wear them correctly...i was pulling them up too high ...didnt know how to style them but the sales assistant showed me many ways to wear these. Dressing it up for a casual brunch and changing it up a bit , with red heels and bonjour bag. I love the white trim and buttons. Looks fabulous with white tops, i even wore it with my fave white and red body suit and i received so many compliments. Thanks to the sales assistant at review. I was worried i would look big but she advised best options for my body shape to compliment both my shape and show off the white trim /buttons which caught my eye. Super comfy. Rated 5 out of 5 by Nathalie from The most gorgeous pair of culottes These are simply fabulous. 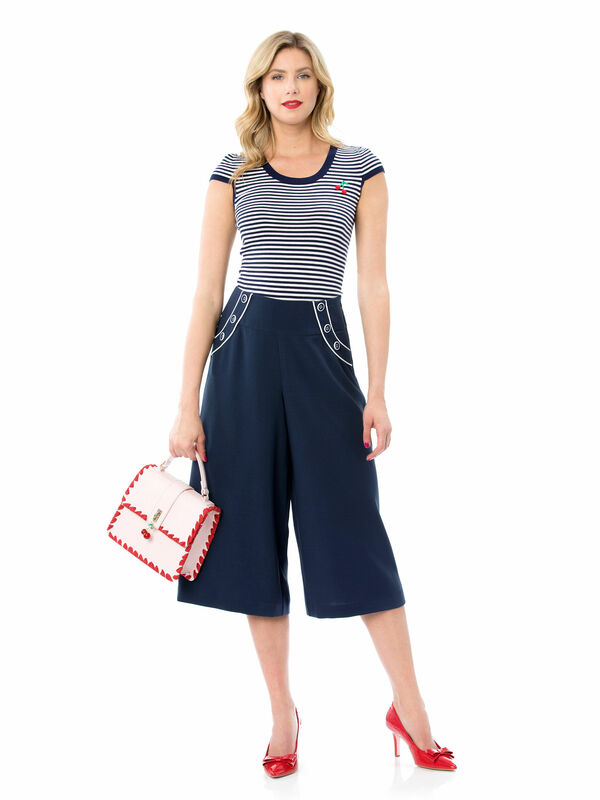 I had been looking for a pair of navy culottes when I spotted these on the Review website- they are so perfect. They match so many of my Review tops and maintains a professional yet whimsical touch with the buttons . I can’t speak of these culottes highly enough! I love them. Every review I read commented on the comfort factor and I can only echo this statement! Rated 5 out of 5 by 80’sEm from Stunning culottes I bought these last week without trying on but loved the look of them. After getting them home and trying on and realizing they were too big I was devastated as they felt so amazing. The review staff were so amazing found me the same pair in a smaller size in another store and I was able to exchange with no problems. The fit is very flattering and I’m extremely happy. Rated 5 out of 5 by Tavo10 from Love the stylish look I went into a store and fell in love with the Culottes so I tried it on and it fit me perfect. The look was very feminine, good cut. I love the colour navy and bit of white showing. I am very happy that I found my size and would recommend this product. Rated 5 out of 5 by Francesca from Stylish and comfortable I love these culottes. They fall beautifully over the hips but highlight the waist, are soft and comfortable and a great option for hot days. They can be dressed down with colourful flats or worn with heels for work. Rated 5 out of 5 by Gayle M from Very stylish & comfortable I ordered on line & saw in MYER recently tried them on & purchased straight away as couldn’t wait for my online order to arrive. Now have 2 pairs (which I don’t mind at all) have received so many compliments at work. Rated 5 out of 5 by AJack2018 from Versatile culottes Bought these a month ago and I’m so happy I did! They’re easy to dress up or wear casually with the right accessories, from Review of course! Would highly recommend. Lots of compliments from friends and family.